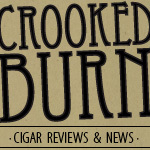 Last week I received a package from Smoke Inn which contained two of the cigars up for review today. I honestly hadn't heard of these cigars until they were on my doorstep. Erik Espinosa was one half of the popular, but now defunct, EO brands. I had been a fan of EO for a long time so I'm happy to see that both Erik with this E Doble and Eddie with his Serie D are still in the tobacco business. One thing to note is I do not know who is making this cigar, but I do know that it is not where the EO brand cigars were made in the past. I'm sure someone knows who is making it, and if you are reading this, please add a comment with the answer. On to the review. This cigar had a very attractive wrapper. The color tone was mostly a medium brown but had some red hues in it too. There was a pretty big seam on the stick, but that's never bothered me -- not nearly as much as a big ugly vein anyway. The pre-lit aroma had a nutty scent, but also slightly off-putting sour notes. 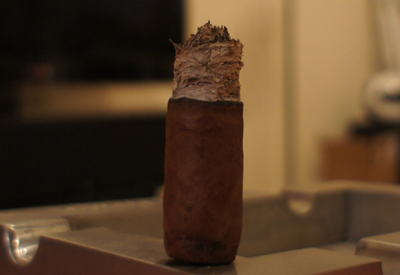 The capped clipped cleanly (even with the very dull cutter I was using) and the cold draw had a very dark, earthy flavor. This flavor was very strong and, even without lighting the stick, it coated my mouth. 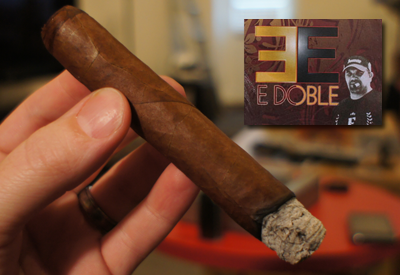 Lighting up my E Doble was no problem and the cigar plumed smoke nicely. The starting flavor profile I got was a vegetable-like taste on the front with a dark charred wood finish. Not what I was expecting at all from the cold draw and was slightly disappointing. 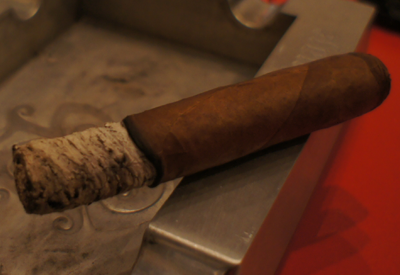 The smoke on each draw, although there was a lot of it, was very airy and left my mouth feeling a little dry. The construction and the draw on this first third was perfect. 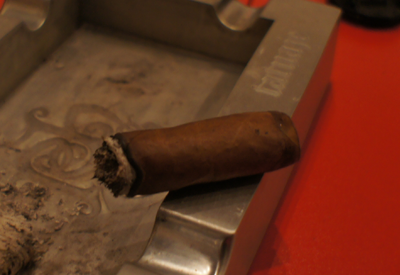 The cigar had a razor thin burn line. I would say the nicotine strength was in the medium range. In the second third third, I had a bit of a change on the front of the taste profile with hints of citrus mixing in with the veggie flavor. That part was not all that bad, but, unfortunately, the charred wood finish continued to be heavy and dominate. That is not a flavor I really like and was definitely putting me off this cigar. The construction, like the first third, was perfect and never needed a re-light or touch up. The nicotine strength stayed at a consistent medium. There really isn't anything else for me to write in the final third that you haven't already read in the first two. The flavor profile was the same with veggie/citrus front and heavy, think char on the finish. 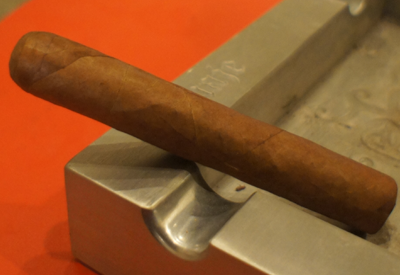 The nicotine strength never rose above medium and the performance of the cigar never wavered from excellent. Final thoughts on the E Doble by Erik Espinosa? This is not a cigar for me. Although it burned a draw beautifully, the taste profile is not my style at all. I kept hoping some of the heavy burnt char flavor would lighten up or turn peppery, but it never did. That said, if you like a dark profile flavor cigar, you might just like this. And they are really inexpensive. Here is a link to Smoke Inn which is the only place you can get these.